Thanks to Mishka at Bureau Direct for sending these markers over! She didn't ask me to review them but I thought someone might enjoy it. 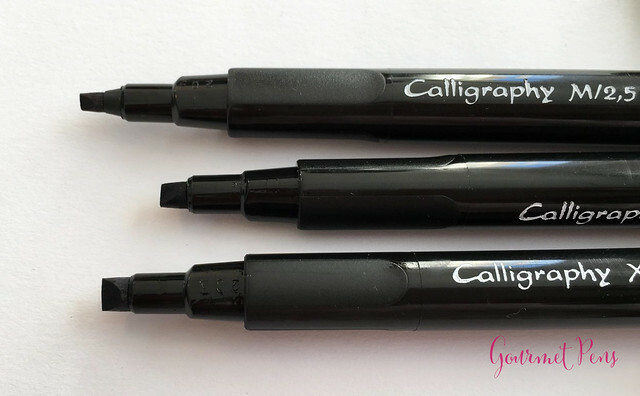 If you're looking for some affordable calligraphy markers to try out - maybe to see if you like calligraphy? - these are safe and simple! These calligraphy markers are packaged in a simple cardboard box. I think a little guide along with them would be ideal, because these are geared towards beginners and one might not have any clue what to do with them! 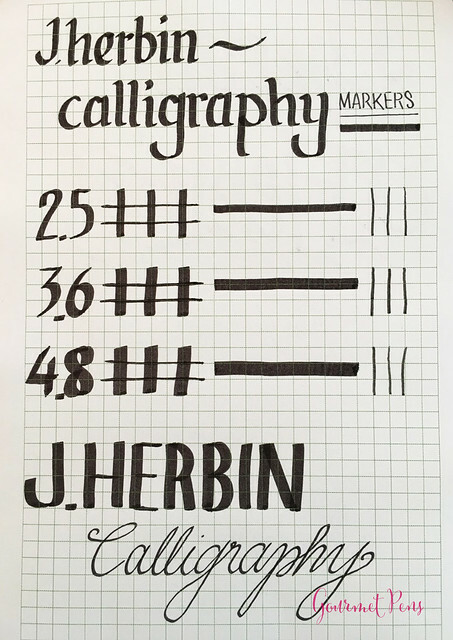 A guide that shows a new user what they could do with them and how to use the marker tips would be easy to include. The Pilot Parallel Calligraphy Pens include a small guide, which is easy to follow, and not intimidating. These are very basic plastic pens with round bodies, short, blocky, black plastic clips, and short caps. There are three matte facets on the end of the barrel and on the cap, but the rest of the pen is a shiny black plastic. Uncapped, there is a narrowing nose towards the felt tips. The barrel of the pen is stamped with Calligraphy and the tip sizes - M 2.5 (medium), B 3.6 (broad), and XB 4.8 (extra-broad). These aren't the most beautiful pens ever, but there's nothing wrong with them for what they are. 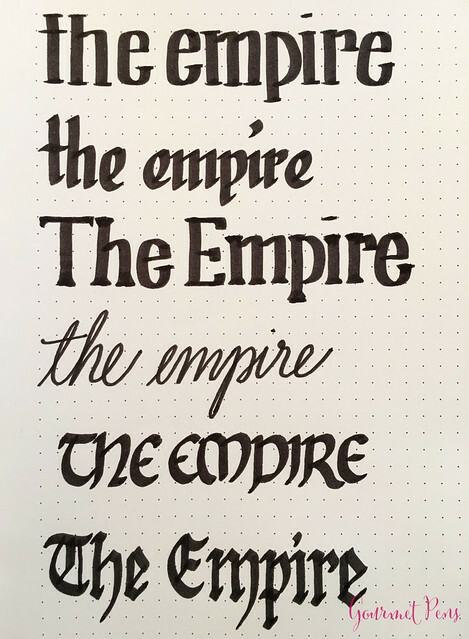 For about $10, you can play around with some felt tip calligraphy markers with black ink. The ink is decent enough - it dries really fast and doesn't smudge around. It isn't a deep, super saturated black, but it's black. No sheen, no spectacular qualities, just a black marker. Nothing wrong with that, because it's simple, doesn't smell funny, and it's affordable. 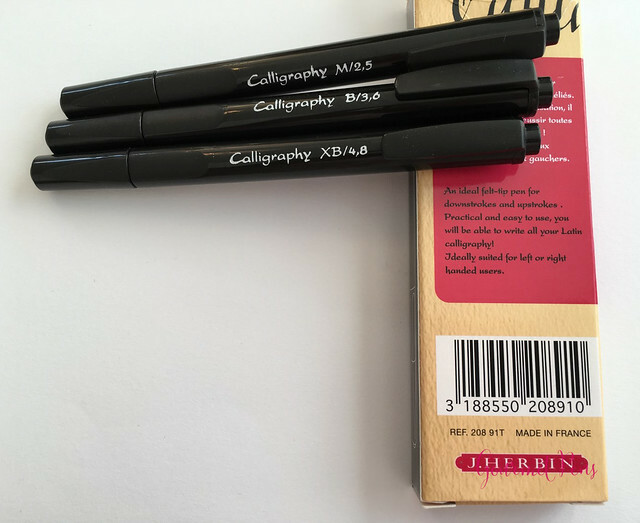 Chances are you want pens like these to try them out - perhaps to try your hand at calligraphy, or to add simple flourishes to something you're already doing. Addressing letters to friends? Addressing envelopes? You can flip them on their corners for finer lines, but be gentle because this will dent the somewhat pointed corners. These are fun to play around with, and are better for fonts like italic, because the tips are not extra crisp and precise to give the variation needed for Old English/Blackletter. I tried. I'm not a calligraphy so in the hands of a master, these probably could be used to produce some great stuff. 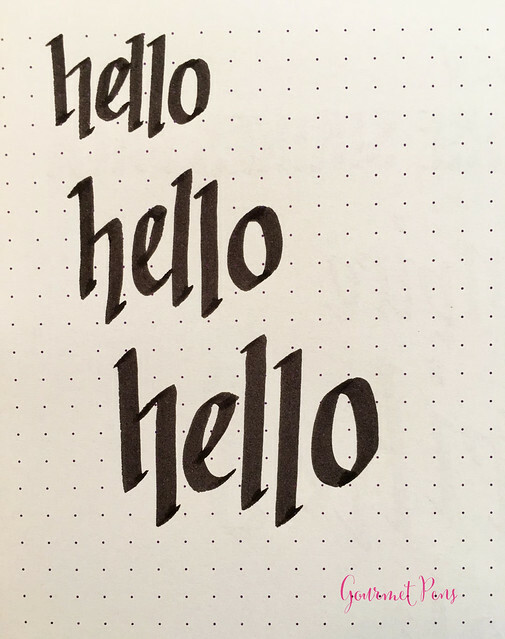 For me, I found these best and most fun for italic styles, just as the box suggested. The marker tips write fairly smoothly, and have even ink coverage. So far, they're still going and have not dried out or run out of ink. 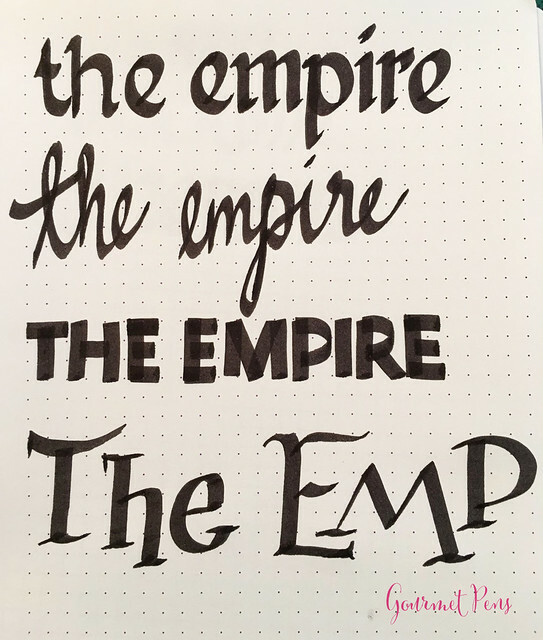 They are also pretty forgiving if you do not keep them perfectly aligned with the paper, which makes them great for getting the hang of what calligraphy feels like. My favorite is the 2.5 - it feels the most crisp and versatile. A light hand is sufficient for ink flow, and it also keeps the tips of the markers in the best shape possible for as long as possible. If you press down, you may get a little more ink flow, but it doesn't make much of a difference and it will just wear out your tips faster. 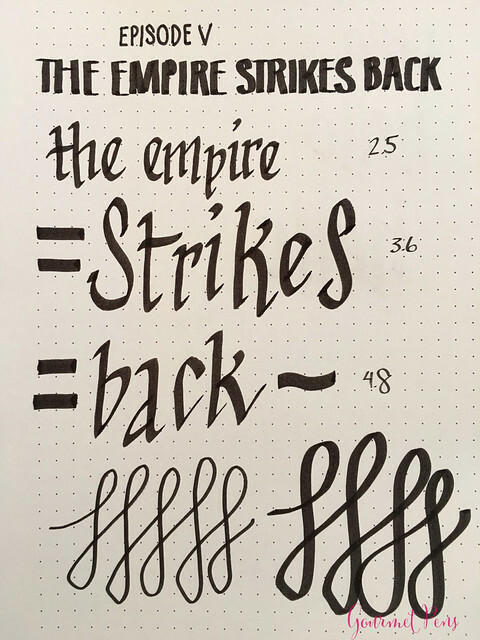 Good idea for trying calligraphy. Ink is pretty water resistant - some washes away but it remains legible. For left- and right-handed writers! Not super precise tips, but that's ok. 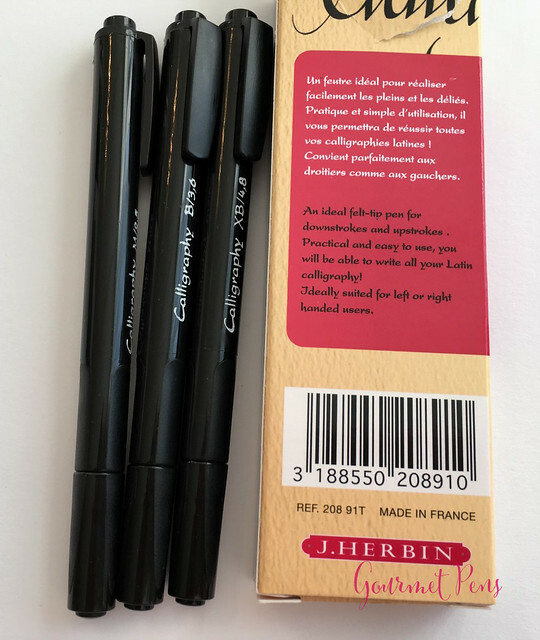 These J. Herbin Calligraphy Markers are well suited to new users, or for those who don't feel like mucking around with dip nibs or fountain pens. They're easy and safe to carry (no leaks), easy to use, and affordable. 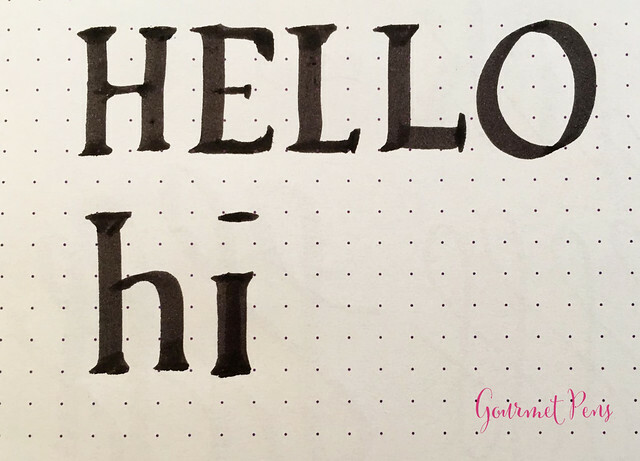 Great for simple flourishing, pretty italic handwriting, for testing the calligraphy waters, or just for fun.